Every society and culture has different traditions and styles for weddings and engagements. Choosing the perfect ring can be a difficult choice. An Irish engagement ring could be the perfect choice for your special someone, whether she’s Irish or not. The symbolism available is not only beautiful, but classic and timeless. Well, you’ve decided to ask her to marry you, and you’re ready to buy a ring. So, how do you know if an Irish engagement ring is right for her? To ensure that she’ll absolutely love the ring that you pick out, here are a few tips. The number one tip for picking out any engagement ring is to pay attention! Note her taste in jewelry, what type of metal she prefers, and what type of gems she prefers. Does she prefer modern or traditional? Low key or flashy? Try to get her a ring that stays more toward her type of style. If you’re not sure of her style, take her shopping. Linger a little around the jewelry counter. Most woman will likely open up and say which rings they like and which they dislike. Chances are, if you’re looking into buying an Irish engagement ring, you’re bride to be is most likely Irish. If she’s the type of woman that would proudly display her Irish heritage, an Irish engagement ring could be the perfect decision. The surest way to buy a ring that she’ll love is to let her pick it out herself. Of course, if you plan to surprise her with an engagement ring, this may not be possible. Letting her pick it out herself though, will eliminate any possibility of her being unhappy with the ring. Whether you or your bride are Irish or not, their are a number of reasons why choosing an Irish engagement ring can work for you. There is also an equal number of beautiful styles to choose from. The possibilities are endless. For some, a traditional diamond engagement ring just won’t do. Perhaps you want something a little more unusual or something with a little more meaning. An Irish engagement ring is an unusual and beautiful choice. The styles that you can choose from blend together classic style and modern individuality. This is not your typical engagement ring. If your bride to be has strong Irish roots, You should strongly consider looking at traditional and modern Irish engagement rings. Not only are they beautiful, but they will show that you are willing to go that extra mile. Probably the most traditional Irish engagement ring would be the claddagh ring. This unique ring is becoming increasingly popular, and it has two hands holding a heart with a crown on top. This ring is steeped in Irish tradition and it is very symbolic. The heart, obviously enough, represents love. Meanwhile, the hands represent friendship, and the crown symbolizes fidelity. Every part of a successful relationship is put together in one simple ring. It is said that the way a woman wears a claddagh ring can indicate her relationship status. If the ring is worn on the right hand with the heart pointing out towards the finger tip, it means that she is single. A claddagh ring on the same hand with the heart pointing inward towards her hand means that she is in a relationship, but she is not yet engaged. If a claddagh ring is worn on the left hand with the heart facing out, it means that the lady is engaged. A woman is married if the heart on the ring is pointing inward. Claddagh rings can be as simple or as intricate as you wish. It can be plain gold or silver, free standing, or etched into a band. If you prefer something a little more unique and special, it can be embellished with stones such as diamonds, emeralds, or just about anything else. Celtic knots have a long history, and if you are looking for an Irish engagement ring, this may be the perfect choice. There are a number of different knots to consider and each symbolizes something different, so don’t just buy a knot because it looks good. Find out a little something about the Celtic knot you buy. Ask your jeweler, ask a friend, or look it up online. Showing that you did your research and got her a meaningful ring will sweep her off her feet. Most Celtic knots represent, in one way or another, all life connected. An Irish Celtic knot engagement ring symbolizes the everlasting love shared by two people. It is this love that binds them together in marriage. 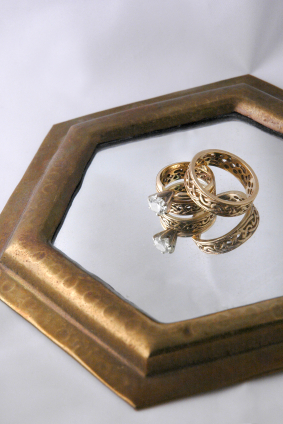 Some particular Celtic knot rings can be made to symbolize a particular family heritage. Their are a wide variety of Celtic knot engagement rings to choose from. These range from simple to extremely intricate. It can be a simple, plain band, or it can be embellished with one or more stones. One popular style of this ring is one crafted with different metals. The contrasting colors of each metal highlights the weave in the ring and makes it more pronounced. While many may want an Irish engagement ring, some may want a more subtle way to express their heritage. For those that want a less overbearingly Irish engagement ring, consider an emerald. These stones are associated with Ireland because of their deep, rich green color, and nothing says “Ireland” like the color green! An emerald can make the perfect choice for a wedding ring, whether you’re Irish or not. They can be put into a traditional engagement ring setting or in something fancier. Solitaire emerald engagement rings are beautiful and simple. An emerald Irish engagement ring accented with diamonds is a bit more intricate and simply breath taking. Many people may think that buying an engagement ring requires a year’s salary. While it is true that dropping a few coins in your local supermarket’s quarter machine is not recommended, you also do not have to spend an arm and a leg. To use an old cliche here, it’s the thought that counts. There are a number of inexpensive options for an Irish engagement. As with any ring, the price that you will pay depends on the specific ring. Prices vary with the style, type of stone and metal, quality, and a number of other factors. Silver is generally much less expensive than gold, and a quality Irish engagement ring without any stone embellishments could run as low as $50. Gold is more expensive, and they will usually run from $100 and up. White gold, as a rule of thumb, will usually cost about $100 more than yellow gold. Adding stones, such as diamonds or emeralds, will increase the cost of the ring. Emeralds are a good choice to consider if you’re on a tight budget and want a stone in your engagement ring. These are usually much less expensive than diamonds, and they are just as durable and beautiful. If you’re looking for glam, glitz, and flash, there are also a number of more expensive options to choose from. Some more elaborate Irish engagement rings can be purchased for a couple thousand dollars. Although choosing a size for an engagement ring does not have to be perfect, getting it right the first time will both impress your beloved and may save you money to have it resized. To some men this may seem to be quite a task. After all, most are not familiar with women’s ring sizes. It is not impossible, though. Using a few tips can help you pick the correct size ring for your future wife. If she has a ring that she wears on occasion, you’re in luck. One of the easiest and most secret ways to figure out a woman’s ring size is to get ahold of one of her rings. If it won’t be missed for a day or so, you can take it to a jeweler to get the size and return it later. If you know that she’ll realize it’s missing, trace the inside of the ring on a piece of paper, or make an impression in some modeling clay. Make sure that you clean the ring off afterwards. Slipping the ring on one of your fingers and marking the spot where it stops can also help determine her ring size. Knowing her sleeping habits can help you get her ring size also. If she is a heavy sleeper and won’t wake up, take a piece of string or small slip of paper, and wrap it around her left ring finger. Tie the string, or mark the piece of paper where the ends overlap. Close friends and family can be invaluable assets when planning a surprise engagements. Many female friends will borrow or try on the other’s jewelry. If they don’t know for sure, ask them to slyly find out. Make sure that they aren’t the blabber mouth of the group, though. You don’t want your surprise ruined because your fiance’s friend can’t keep a secret. The easiest and most obvious way to find the best price on an Irish engagement ring is to comparison shop. Since running from store to store can be exhausting and take forever, compare prices and best deals online. In addition to being much easier, shopping online for an engagement ring has other advantages. There are no salesmen hovering around you, and there is no pressure to buy. Many companies will offer a warranty or guarantee on their rings in case anything goes wrong. In most cases, you will have to have the ring cleaned and checked once a year. If this is not done, some companies will void the warranty. Local independent jewelers generally have a lower price than many of the bigger chain stores such as Kay and Zales. The larger, more known stores spend an outrageous amount of money per year on advertising, and in turn, they have to jack up their prices. Local jewelers may also be able to custom make an Irish engagement ring just for you, and their craftsmanship is usually top notch.